While the white amaryllis continues to bloom (I’m now on blossoms 3,4,5 & 6! ), Rosalie is now also in bloom. I adore the pale pink petals and vibrant green center of this variety. It’s delicate and lovely and perfect for spring. And speaking of spring . . . it’s spring break! Dale and Hannah are both off from school next week and I’m taking a few days off as well. We’ll be enjoying what I think is our first ever vacation with just the tree of us. New York City here we come! Our plans include Hamilton, To Kill a Mockingbird, the Tenement Museum, Color Factory and whatever else inspires us. I won’t be blogging but I encourage you to follow our adventures on Instagram if you’re so inclined. Go to Harry Potter! Story, not so much, but theater restoration and staging are remarkable. That list sounds a bit like you’ve gone from tourist to tour director. Enjoy! I had a pink amaryllis a few years back. We planted the bulb in a big pot outside when it had finished blooming. Each spring we had lots of flowers. A few years later it had turned into six bulbs. We put them in the ground. This week we have dozens of flowers! The amazing increasing amaryllis! We live in Texas so maybe if you’re in a place that freezes you won’t be able to put them in the ground, but just know that multiplying is their nature. Have fun in New York. That is one stunning Amaryllis! Enjoy NYC – looks like you have a lot of fun things lined up. That’s great to get a vacation with the three of you, and it’s also pretty nice that you’re visiting NYC with them for the second time in two months! Enjoy it all! Have a wonderful time Carole! TKAM! It’s going to be so great!!! Sounds like you’ve planned a marvelous vacation. Have a fantastic time! I want sock yarn that color. Ooooh—enjoy every minute in the Big Apple! I can’t wait to hear about To Kill A Mockingbird… I truly think that Jeff Daniels is the only person alive who could play Atticus Finch. Ah – looks like you had a GREAT time in NYC! Sara went to Color Factory and had a ball (literally. in the pit. just like y’all did!) 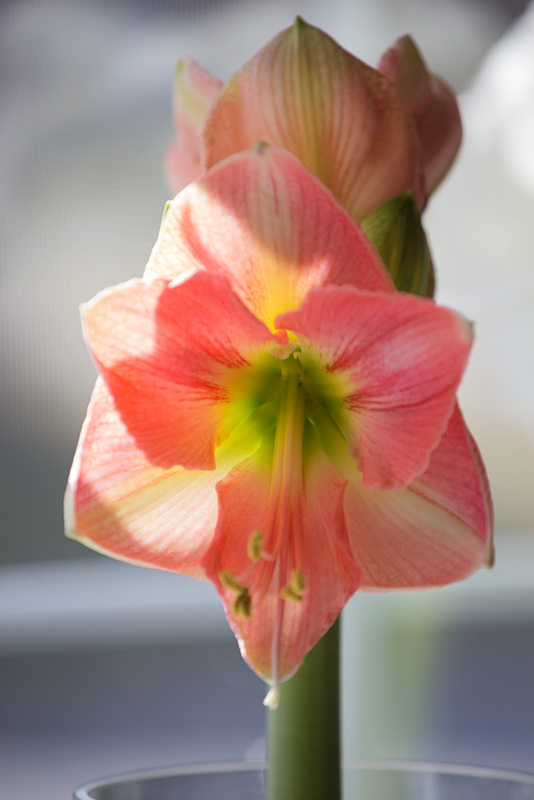 LOVE your Easter Amaryllis – I think I have one more bloom coming. Maybe May Day Blooms will be a thing? !